The Drafting Office is a room inside the Old Clockworks in Luigi's Mansion: Dark Moon. The Drafting Office is accessed by taking the door on the right on the second floor of the Warehouse or by taking the door on the left on the second floor of the Clock Tower Gate. This is a large room that is divided by a wall. In the first area, there is a desk with several open books, a chair and a writing desk, a file cabinet, and a vent on the wall. The posters in this part can be removed to reveal holes and money. Blowing the ceiling fan causes the wall to retract, allowing Luigi to move behind it. In this part of the room, there is just a desk and a chair. Luigi can blow through the vent to spin the fan that moves the wall from this side. The door to the left leads back to the Warehouse and the door to the right leads back to the Clock Tower Gate. During A Timely Entrance, Luigi needs to go to the Drafting Office to get the Special Compass. When going to the Drafting Office, Luigi is ambushed by three Sneakers. 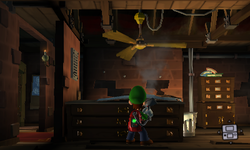 After defeating them, Luigi can use the fan to move the entrance to go behind the wall and inspect the desk to get the compass. In Play Catch, the Polterpup runs into the Drafting Office after Luigi finds it in the Workshop. Inspecting the file cabinet causes the Polterpup to jump out, but it immediately runs to the Roundhouse. During Outlandish Interruption, the Drafting Office might be one of the room infested with ghosts. This page was last edited on March 1, 2019, at 18:34.